The phrase which is attributed is termed attributive focus in this website. 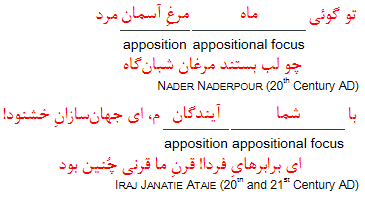 As these examples highlight, in Persian there is an appositional concord in the number: The apposition and its focus are in the same subcategory of number (singular or plural). Genitive is a kind of phrase syntax that sets two constituents in a hierarchical relationship (normally using the enclitical conjunction /-e/). This dependence of the modifier from the nucleus distinguishes genitive phrases from coordinations. Genitive phrases are normally endocentric, which means that the nucleus (or the modifier) is the reference of the genitive phrase. For example, /bærg-e ʧenɒr/ برگِ چنار is a determining of /bærg/ برگ, and /mɒh-e ordibeheʃt/ ماهِ اردیبهشت a specification of /mɒh/ ماه. کارگران دستِ خالی از اتاقِ رییس بیرون آمدند. راه درازست و ما پایِ پیاده. 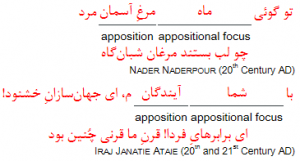 In these examples, /dæst-e xɒli/ دستِ خالی is neither /dæst/ دست nor /xɒli/ خالی, and /pɒ-je piɒdæ/ پایِ پیاده is neither /pɒ/ پا nor /piɒdæ/ پیاده. Asyndetical genitive phrases are not lemmas; this feature differentiates them from synapses ↓. Determinative composition is a type of composition in which the constituents have a hierarchical relationship. These constituents are called (similarly to constituents in genitive phrases) the nucleus and modifier. Unlike genitive phrases, determinative compounds are lemmas. This feature differentiates synapses from asyndetical genitive phrases. A determinative composition (in the Sanskrit grammar tatpuruṣa तत्पुरुष = “that person’s man”) is endocentric if the nucleus (or the modifier) is the reference of the composition. For example, /tut-færængi/ توت‌فرنگی is a determining of /tut/ توت, and /ɒtæʃ-gærdɒn/ آتش‌گردان a specification of /gærdɒn/ گردان. The reciprocal pronouns /hæm-digær/ (/hæm-degær/) هم‌دیگر، هم‌دگر, /jek-digær/ (/jek-degær/) یک‌دیگر، یک‌دگر and in archaic idioms /jek-digærɒn/ یک‌دیگران as synapses. In archaic idioms, the ordinal numerals /do-digær/ دودیگر and /se-digær/ سه‌دیگر as synapses. With a non-finite verb form as a nucleus. A determinative composition is exocentric (in the Sanskrit grammar bahuvrihi बहुव्रीहि = “having much rice”) if neither the nucleus nor the modifier is its reference. For example, /doʃmæn-ʃɒd/ دشمن‌شاد is neither /doʃmæn/ دشمن nor /ʃɒd/ شاد, and /del-morde/ دل‌مرده is neither /del/ دل nor /morde/ مرده. Nevertheless, the modifier also determines the nucleus in these compounds.